It is a dreary and raining in NYC today. Thankfully, the first bag I opened up had a little ball of sunshine in it. The cutest little fox slippers we have ever seen were in that bag. This led to the discovery of a wonderful brand out of England called Sew Heart Felt. The Sew Heart Felt Collection is skilfully hand made by women across the world, using local traditional crafts handed down over many generations. Where ever possible they are made using organic fibers and eco friendly pigments. Check out examples of other items listed on their website below. 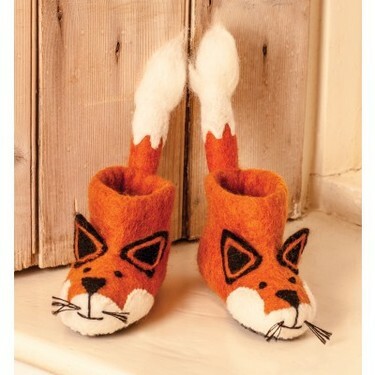 We actually got in a pair of these cute little fox slippers. They have a whole variety of little animal slippers. They make little felt wool animal rugs! Did I mention the slippers also come in adult sizes? Go check out their entire website! They also have puppets, mounted animal heads, and cushions!